An Adventure traces the story of Jyoti and Rasik as they travel across India and Kenya before settling in the United Kingdom. The audience watches their adventure begin in 1950s and sees how their lives unfold as each act jumps a bit farther into the future until recounting their lives in 2018. 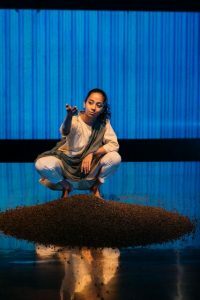 Vinay Patel’s text is well constructed as each of the three acts show a snapshot of the lives of newlyweds Jyoti, played by Anjana Vasan, and Rasik, played by Shubham Saraf. Once in Kenya, Rasik’s business partner David, played by Martins Imhangbe is also introduced. It is through Rasik and David’s experiences that a comment on colonialism is created from the point of view of the colonised. Patel’s ability to weave together the romantic story of the two main characters as well as explore historical elements of the Kenyan independence movement is well thought out. From the first scene both leading actors Vasan and Saraf stand out. Vasan’s cutting yet funny tone creates a strong intelligent feminine presence on stage. This blends well with Saraf’s quirky likeableness. The two actors have clear chemistry together and they add texture to this production, making it easy for the audience to delve into the story of their lives. Imhangbe is a lot less easy to watch, but for all the right reasons. He is angry, ready to fight, and his tension is palpable as soon as he steps on stage. This makes his presence a bit discomforting. His intensity creates an atmosphere that permeates every scene he is in, making it have a powerful impact. The third act is where this play falters a bit. Two new actors are introduced to play older versions of Jyoti and Rasik. Both actors Nila Aalia, playing Older Jyoti and Selva Rasalingam, playing Older Rasik are able to deliver on an emotional scale and create their own chemistry together. However, their chemistry is different from the younger pair’s. This gives the impression of following the story of two new characters as opposed to a continuation. Furthermore, Imhangbe is still playing David, which begs to question: why replace some actors but not all? It becomes slightly confusing, difficult to suspend disbelief, and ultimately, difficult to create an emotional connection with this new pair so late in the show, even though they clearly deliver the text well. Review written by Elizabeth Leemann.